Company History | Univenture, Inc.
Ross Youngs founded Univenture, Inc. in 1988 alongside the invention of his Safety-sleeve® disc packaging design; in the 25 years since, Univenture has grown to become a full service designer, manufacturer, and distributor of packaging products used in dozens of industries the world over. With more than 50 issued patents worldwide, Youngs and Univenture can credit a great deal of their successes to ingenuity. The revolutionary Safety-sleeve® material, which allows slim and secure disc protection, made such waves in media industries that it led to Univenture’s first of five inclusions in the Inc. 500 Fastest Growing Companies. The invention of the patented U-1000 system in 1997 similarly transformed the limits of high-volume, highly customizable, completely automated media packaging. Univenture brought in the 2000’s with even more diversified product solutions. The UniKeep™ brand launched in 2000 to offer both businesses and consumers superior document organization and storage, and Modern Plastics recognized the patented UniKeep Case Binder as one of the best-designed products of 2002. In 2003 Univenture launched the EnvyPak™ brand to combine clear polypropylene envelopes and custom printing options for use in impactful direct mail campaigns. Ingenuity not only defines Univenture’s unique products, it has also long been a hallmark of the company’s greater business practices; for example, Univenture.com was one of the first packaging manufacturer sites on the web. Youngs has also used his distinct background in environmental science and industrial engineering to keep Univenture at the forefront of green initiatives and groundbreaking technology. For these reasons, he has frequently been recognized as a noteworthy entrepreneur – including as Business Person of the Year by the U.S. Small Business Administration and Manufacturing Entrepreneur of the Year by Ernst & Young. Univenture has maintained sales and manufacturing operations from its Marysville, Ohio headquarters since 1994, and supports global distribution capabilities. Since 1988, the Safety-sleeve® design has remained the absolute gold standard of media packaging – no matter the volume. As Univenture’s original innovation, the Safety-Sleeve design has a long and storied history. Founder Ross Youngs developed his first patented invention while working in the tech industry with traditional cases, which were bulky and left discs susceptible to damage. The unique, non-woven, clean room fabric that Youngs incorporated proved integral to the design; products bearing the Safety-sleeve seal still use this material, which allows minute debris to fall through it and become trapped away from the disc. The material’s slim profile also allows Safety-sleeves 75% thinner than traditional jewel boxes, and with abundant customization options to boot. Since dramatically less material is used in comparison to jewel boxes, Safety-sleeves are a greener product option as well. Paired with Univenture’s incredibly efficient U-1000 machinery (which can process up to 4000 disc-inserted units per hour), Safety-sleeve products stand out as the most pragmatic, cost-effective disc packaging on the market. Clients may entrust Univenture with fulfillment, or may arrange U-1000 automation in their own facility — reducing costs and logistical demands for large orders. Over the last 25 years, Safety-sleeves have become the preferred packaging solution for tier-1 media suppliers worldwide – but with options at every budget and scale, the benefits of Safety-sleeves are welcomed anywhere there are compact discs. The UniKeep™ product family enhances document storage and presentation. Ross Youngs launched UniKeep in 2000 to offer premium storage and presentation solutions; the brand’s core product, the UniKeep Case Binder, is the 100% polypropylene answer to the traditional vinyl 3-ring binder. UniKeep binders surpass traditional binders in virtually every aspect. The injection molding process creates a unique, single polypropylene piece; because the product contains no metal or vinyl whatsoever, the unit is also 100% curbside recyclable. In addition to being an eco-friendly alternative, UniKeep binders are ergonomically superior as well. The snap-locking poly rings will never pinch your fingers, misalign, or rust, and the fully-enclosed case design holds even loose materials in place and allows for neat storage anywhere. From disc-sized wallets to large-format presentation binders and several sizes in between, and with design possibilities including clear overlays and digital printing, UniKeep products feature outstanding customization potential. Furthermore, the wide range of EnvyPak and Safety-sleeve products athand makes UniKeep custom packaging the most versatile available on the market. EnvyPak™ clear envelopes and mailers offer unmatched exposure and quality. Univenture launched the EnvyPak brand in 2003 to offer creative solutions for direct mail in cost-effective, versatile configurations. All EnvyPak products share an engaging, interactive quality that achieves the maximum possible impact for various marketing applications. The premium, crystal-clear envelopes at the heart of the EnvyPak product line stand out from all other mailers and enhance their contents – even before being opened. Combined with EnvyPak’s full-color printing expertise, the resulting custom work is at the pinnacle of today’s direct mail market. EnvyPak mailers are USPS-approved, 100% recyclable, designed to be fully compatible with automation equipment, and available in various custom shapes and sizes. The EnvyPak line also features clear poly pages, pockets, and other products that can be modified to customer specifications. The PackZen™ division specializes in manufacturing and customizing premium vinyl binders and other flexible film products. Univenture launched PackZen in 2012 in order to offer regional industries a top-quality source for custom vinyl binders, pouches, pages, and other flexible film products. The PackZen team prides itself upon ensuring a first-rate customer experience for its American-made products. PackZen’s expertise in high-frequency welding and ultrasonic welding make completely customized vinyl products an efficient, cost-effective possibility. The division is perhaps known best, though, for its versatile custom binder choices for businesses of all sizes. 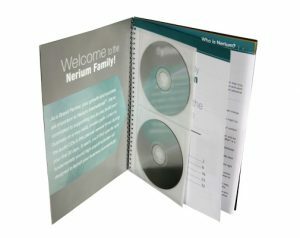 PackZen’s “Create Your Own Binder” web platform allows customers to personalize and customize premium vinyl 3-ring binders in bulk quantities, making affordable custom binders accessible for company manuals, seminars, promotions, and press kits.